What will your dream look like this summer? Hello, gardeners and friends of gardeners. Not much going on in most Gardens of The Horde right now, though we did get one outstanding example of a garden in Florida. Many of the rest of us are dreaming about future gardening. HH has been campaigning to have the Food Thread follow the Gardening Thread. Probably not feasible. But that doesn't mean we can't do a preview. Think about the kind of tomato you might want to plant (or the plant you might want to give to a neighbor) to create a custom BLT on Labor Day Weekend, as seen above. That looks like one of the darker varieties of tomato. There is also a German Potato Salad recipe at that old link. In case you are hungry today and still have some potatoes you grew last summer. Cumberland Astro also had a great idea that sent me into the Gardening Thread archives. We can compare the information there with what is in our current seed catalogs. Remember, especially in the case of heirloom tomatoes, early planting is often key. Below, Cumberland Astro's tomato categories and great information from his own garden are interspersed with my experiences and photos and info from old threads, to get you going with observations of your own. BEST ALL AROUND WORKHORSES: Celebrity and Better Boy. In all three environments in which I've gardened, these two tomato varieties have been healthy, prolific producers of flavorful tomatoes. I like those, too. And an indeterminate cousin of Celebrity whose name escapes me at the moment. Anybody else have a candidate? BEST CHERRY: Sweet 100. I've grown this in all three environments and it has always thrived. I've never lost a plant to disease, and one plant provides abundant cherry tomatoes all year. I have trouble getting even cherry tomatoes to last all season, but I am partial to Sun Gold early on and Chocolate Cherry in the fall, from a late planting. Do you have a favorite cherry? Back in 2015, we discussed the breeder who bred Maglia Rosa, which is kind of hard for most people to grow, but which is reputed to taste great. It's a little bigger than a cherry. In a July 2015 update, after a hat tip from CBD we discussed Garden Gem, promoted as the "perfect gardent tomato". One parent is Maglia Rosa. Anybody tried growing it? Ws it perfect? 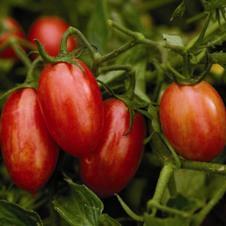 WORST PLANTS: All the "Beef" tomatoes - Beefsteak, Beefmaster, Big Beef, etc. I look at the pictures and want these big beautiful fruit, but all I ever get is a sickly plant that struggles to produce one or two sad pieces of fruit. I have done well with Big Beef but not the others. It grows into a huge plant that can sort of shade itself. Not the most prolific ever. I have several "worst" candidates. How about you? HEAT TOLERANT: Although I could successfully produce fruit from the various heat tolerant tomatoes (Heatwave, Sunmaster, etc) when I lived in Texas, these tomatoes were so devoid of flavor I finally quit growing them. Their fruit was literally red orbs of flavorlessness. Store-bought tomatoes have more flavor. Surprisingly, the tomato that I found best for the heat was Early Girl. Early Girl is not my favorite tomato by any means, it's smallish and has so-so flavor, but with a short growing season in Texas, this one was mandatory so as to maximize the short tomato-eating season. I eventually came to realize that while Early Girl may get a little stressed when the other plants die in July, she hangs in there - still producing some fruit throughout July and August, and by September she is producing a strong volume of fruit again. I have done well with the little tough-skinned Fourth of July and with Miracle Sweet (if you can find seeds). Both sort of small tomatoes. 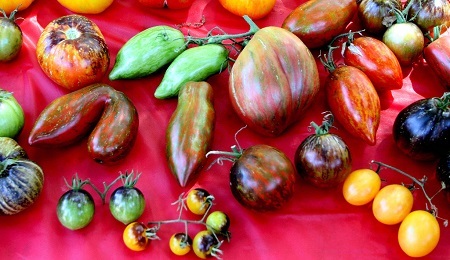 HEIRLOOM: When I had a huge tomato plot in Texas, I experimented with many heirlooms. All but two were either efforts in futility or the production was so negligible (1 or 2 fruit per plant) that I would never bother again. The two exceptions are Cherokee Purple and Brandywine. These are also the two best tasting tomatoes, in my opinion. Cherokee Purple has thrived in all three growing environments, with healthy plants and acceptable fruit production all summer long. I only grew Brandywine in Texas when I had the huge tomato patch. Fruit production was minimal, but the tomatoes were so darn tasty that I'd grow 'em again if I had enough space. Early planting, and for me, part shade and mulch, may make a difference. I have done well with Stump of the World, which is a smaller, tangier version of Brandywine, with Dr. Lyle and with J.D. 's Special C Tex. I have gotten a few Cherkee Purple fruits in part shade. Lush. This old post discusses heirlooms and other tomatoes recommended for various climates. Check out the photo of 'Mexico'. I bought seeds once, but they were for a different tomato. AM I THE PROBLEM: Two hybrids that I read good reviews about but I cannot grow for some reason are Bonnie Original and BHN 602. In all three environments these two have performed as poorly for me as the Beef tomatoes. I keep trying to grow them but I won't anymore. I must be the problem. Haven't tried these. Have you? 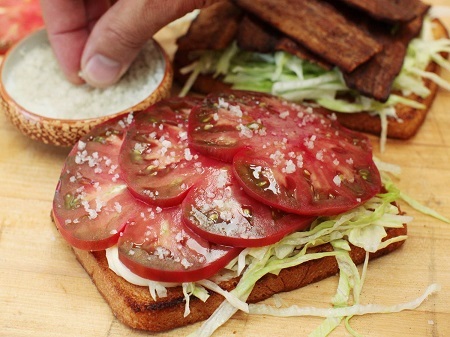 BLT, burger or straight-up tomato? "I thought it would be appropriate to quickly review the topic of determinate tomatoes at the end of summer. Determinate tomatoes bear fruit near the ends of branches, which then quit growing. Some determinate tomatoes ripen all at once, like the commercial tomatoes that fill trucks around here during the summer. Others ripen over a fairly long season. Many of the most adaptable hybrid tomatoes, like Celebrity, are determinate. Some are short and some are bigger, but they are usually bushier than the more vine-like indeterminates. Some short-season growers only plant determinates. There are also some open-pollinated determinates like the old Burpee's Quarter Century, recommended for containers in the desert; Moravsky Div (Wonder of Moravia), a determinate or semi-determinate version of Stupice, called the best early slicer; and Fish Lake, a determinate oxheart for short seasons. 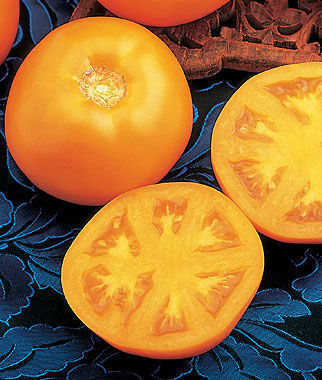 My favorite determinate tomato remains Sweet Tangerine Hybrid from Burpee. Golden Girl Hybrid, sold by Pinetree, tastes almost as good. Both are disease-resistant. They seem to alternate bearing over a long season. I hope to plant them next year. Along with some big pink heirlooms like Stump of the World and Dr. Lyle, for pure luxury. And some workhorse tomatoes. Maybe a new-to-me oxheart, too. 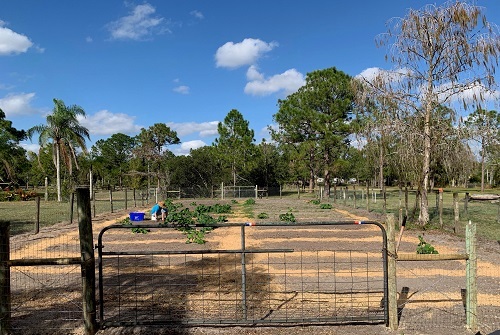 My wife's vegetable garden (photo attached) is about 100' x 45'. We're just getting it going down here in South Florida. There are thirty 4' x 15' beds, plus a perimeter bed. My job was to build the fence (completed yesterday). The squashes you see are volunteers from the compost we tilled into the area. Herself began planting today, starting with various peas and lettuces. She has some trellis-building to do for her pole beans. Cukes and sugar snap peas will go along the fence line. He identified the plants already growing as volunteer squashes from their compost. Most are already flowering, and a few have set fruit. Our compost seems to have superpowers. It's a combination of horse manure and kitchen trimmings. We also have a couple of dozen hens, so there is plenty of calcium from the shells. I think there are a couple of unplanned sweet potato vines out there, too. We'll have a few months where we're swimming in produce, and we'll wind up giving a lot of it away. By May, the only thing that will stay alive is peanuts, eggplant, and okra. We could extend the season with hydroponics and a shade house, but the capital costs are intimidating. Typically, the summer heat and rains chase my wife indoors. That's OK too, because that's when she starts knitting and quilting! I keep myself busy year 'round brewing, baking, and building odds and ends. BTW, grilled okra is awesome! Wow. I am impressed. Can't wait to hear about how the other veggies turn out. Anybody else got something going on in the garden?